Are you and your vehicle ready for the winter weather ahead? Before hitting the road, Coloradans need to ensure that they and their vehicles are prepared should inclement weather strike. ThorntonWeather.com presents the first in a series from the National Weather Service (NWS) as part of Winter Weather Preparedness Week has declared by Colorado Governor John Hickenlooper. Check back throughout the week for more winter preparedness stories. 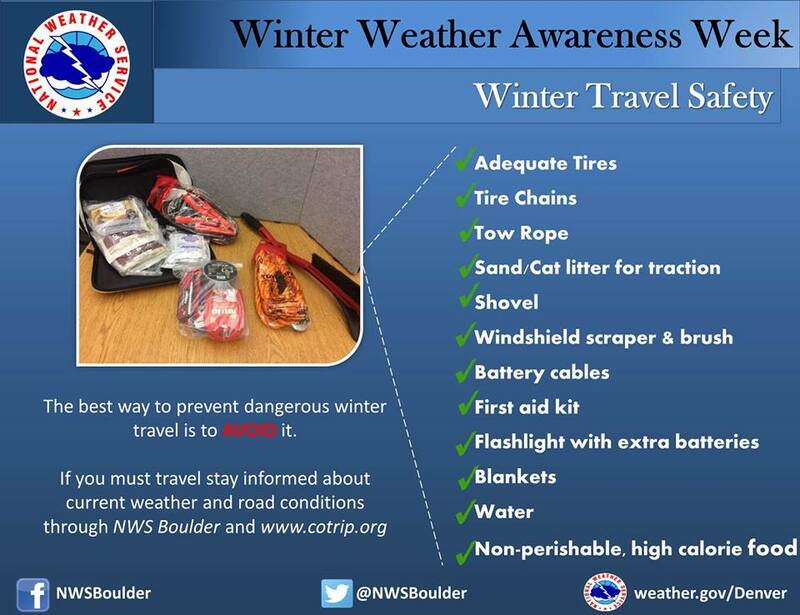 Today’s message from the NWS highlights the importance of having a proper emergency kit in your vehicle and should the worst-case scenario occur where you get stuck, what you should do to survive. Winter Weather Preparedness Week continues through Saturday. Preparedness is a big part of this campaign. Before winter weather arrives in earnest, it is highly recommended that you prepare your car or truck for winter travel. The best way to prevent treacherous winter travel is to avoid it. This can be done by staying informed about current weather and road conditions as well as the latest weather forecasts. 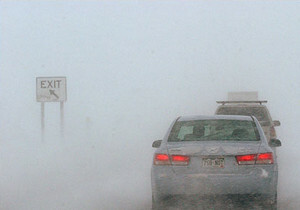 Information on road conditions in Colorado is available on the web at www.cotrip.org or from the toll free number 1-877-315-7623. When calling from anywhere in Colorado, dialing 511 will also access the Colorado road reports. Additionally, a free smartphone application, CDOT Mobile, is available. If you should become stranded during a winter storm, stay with your vehicle an d do not panic. If accompanied by others, take turns sleeping. Run the motor every hour for about ten minutes to maintain warmth, but keep windows open a little to prevent the buildup of carbon monoxide. Make sure the exhaust pipe is not blocked. Keep the car visible with brightly colored cloths tied to the side view mirrors, door handles, or external antenna. At night, turn on the dome light when running the engine. Exercise periodically by vigorously moving arms, legs, toes and fingers. This entry was posted on Monday, October 15th, 2018 at 4:45am MDT and is filed under Thornton Weather, Weather Education. You can follow any responses to this entry through the RSS 2.0 feed. You can skip to the end and leave a response. Pinging is currently not allowed.